Hot on the heels of the Google vs. China censorship dispute, a new front in the showdown between state power and Internet freedom is opening in Italy. Prime Minister Silvio Berlusconi's government is pushing through new measures that would give the state control over online video content and force anyone who regularly uploads videos to obtain a license from the Ministry of Communications. The move is seen as yet another challenge to Google  owner of YouTube  which says the new rules would in effect force Internet service providers to police their own content. But opponents say the video measure is just one of a series of moves by the government to target what it perceives as unfettered web activity. Prosecutors have leveled criminal charges against four Google executives because a video depicting an ugly episode of school bullying remained on YouTube for several hours in 2006 before it was removed. Interior Minister Roberto Maroni also asked Facebook to shut down two anti-Berlusconi fan pages in recent months  one entitled "Let's Kill Berlusconi" and another set up to praise the mentally ill man who attacked the Prime Minister in Milan in December. 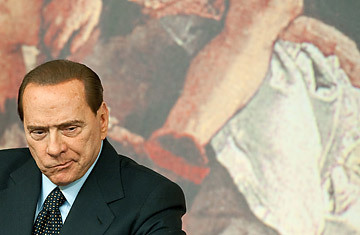 In addition, there have been other bills under both the Berlusconi coalition and the former center-left government aimed at regulating blogs and banning anonymity on the Web. Some say that Italy's ruling class is just struggling to keep pace with the Internet revolution. "Italy's political culture is far removed from new technology," says Luca Conti, 34, a blogger in the coastal city of Senigallia. "They're not even focused yet on how to control the Internet since they haven't even figured out how to use it to their advantage." Case in point: more than 100,000 people attended an anti-Berlusconi rally in Rome last month that was organized on Facebook, but the top opposition politicians snubbed the event. Conti says the country's leaders  left, right and center  are still focused solely on reaching the public via TV and newspapers. And unlike the Internet, the movers and shakers of the old media are some very familiar faces.